What is a Via ? Via is one of the important components of a multi layer PCB. 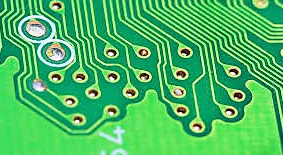 Vias are the means to interconnect different layers on and within the multilayered PCBs. These are used to electrically and thermally connect the traces, pads, and polygons on different layers of a PCB. In simple words, Vias are copper cylinders that are placed or formed in holes that have been drilled through one or more layers in a PCB . Barrel — It is the conductive tube filling the drilled hole. Pad — It connects each end of the barrel to the component, plane or trace. Antipad — It is the clearance hole between barrel and no-connect metal layer. Vias are created during the PCB manufacturing process. Basically, holes are drilled through copper pads on the PCB, a chemical is put in the hole to dissolve epoxy on the internal layers to further expose the interior layer copper pads. Finally, a bit of copper is put in the hole with electroplating. Normally, most PCB manufacturers put sacrificial vias on their PCBs on a section of the production board. So that you can slice the vias and examine the cross-sections to determine the effectiveness of the electroplating process. Blind/Hidden vias : These type of Vias connect an inner layer with the adjacent surface layer. Blind vias start on the surface on one side of the board, but do not extend to the other side, instead they finish on one of the internal layers. Hence these are called Blind/Hidden vias. Buried vias : These type of vias connect two interior layers. Buried vias remain completely encapsulated within the board, and none of their ends extend to any of the outer surfaces of the board. Through vias : These type of vias connect two exterior layers. As the name suggests, through hole vias travel through the board, connecting traces on the outermost layers, and if required, on the inner layers as well. There is another type of vias commonly used in high-density PCBs, known as micro-vias. These vias have very small diameter hole. PCB Manufacturers use different tools such as ultrasonic beams and lasers to drill these holes. Usually, micro-vias are filled with a conductive material to facilitate connecting with the pad on the other layer. However, this can lead to issues with unequal expansion. For PCBs with two-layers, the only option is a through via. However, for boards with more than two layers, you might need blind or buried vias in your design which will obviously cost you more. As we have already discussed that a via is needed to form an electrical connection between internal and external layers, in such cases, the use of a through-hole via places an unused hole (and possibly an unused pad) onto other layers. These unused holes unnecessarily consumes PCB area and interferes with routing on adjacent layers. However, it is the cheapest and most reliable option as compared to the other two vias. 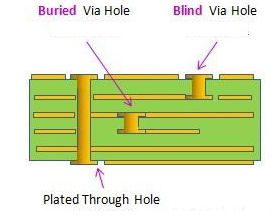 Blind vias can free up the PCB area by creating a connection between the two layers and a hole only on the layers in between. Buried vias are not often used due to expense, reliability concerns, and difficulty of troubleshooting. Type I ( Tented Vias ) : These are the vias that have a mask material applied, bridging over them, with no additional material inside the holes. Type II ( Tented and Covered Vias ) : These are the vias with a secondary covering of mask material over and above the tented vias or Type I vias . Type III ( Plugged Vias ) : These are the vias with material partly penetrating into the via holes. Type IV ( Plugged and Covered Vias ) : These vias are similar to type III vias with a secondary material covering the vias. Type V (Filled Vias ) : These are the vias with material fully penetrating and encapsulating the via holes. Type VI ( Filled and Covered Vias ) : These are similar to Type V vias with a secondary material covering the vias. Type VII ( Filled and Capped Vias ) : These vias are similar to Type V vias with a secondary metalized coating covering the vias. As vias are nothing but holes, most of the manufacturers can handle any of the standard drill sizes. However, efficiency of the production process will increase if all the vias in the PCB are of the same size. This will make the drilling easier and hence will save a considerable time and thus the production cost as well. Vias from drills start from 0.15mm with 0.3mm solder pad and can drill as big as requested, but different sizes may require manual drilling which will further increase the production cost. Holes smaller than 0.15mm can only be drilled by laser drill. Via with 0.6mm hole and a 1mm solder pad is the most common size that can be found on most of the PCBs. You can always check with your manufacturer for their minimum drill size and minimum annular ring for the manufacturing process. Typical mechanical drills don’t go much lower than 12 mil in diameter without frequent breakage, so the manufacturer will increase the cost to account for broken drills. Annular rings don’t often go below 6 mil for standard processing. So the smallest via you would create has a 12-mil diameter hole, and a 24-mil diameter pad. In case you are unable to choose the right vias for your project, you can contact PCBWay.com for guidance. They have a very helpful support team and will certainly help you get the the best solution.